When employing contractors to provide diamond wire sawing and other specific services on your construction sites you want to engage reputable, reliable and responsible operators. National Drilling Services has been working in the construction industry for over three decades and is a leading supplier in the UK. In fact, many of our clients tell us we are the number one choice in the UK for drilling, sawing and demolition. To read more regarding this see our home page. However, let’s get back to the subject of diamond wire sawing and why you might use this technique on your development. Why would you use diamond wire sawing above other sawing methods? At National Drilling Services we have a wide range of equipment allowing us to provide a broad range of sawing and drilling services to the construction industry. As part of these services we can provide the skills and equipment to offer the following sawing services. Here we also explain broadly where or when you might use each of these sawing options. There is obviously some overlap with these sawing services with the decision made partly on the environment or situation on site. For more details about each sawing technique see our webpage on Services. You may be wondering what is the point in having an expansion joint if all you are going to do is seal it? However there are reasons why you would want to engage in expansion joint sealing. These reasons are usually due to health and safety issues, damage reduction strategies or chemical infiltration concerns. If you are not sure if any of these potential risks might affect your concrete floor or slab work then you might want to ask the experts. National Drilling Services is not just about providing drilling and sawing services, we provide expertise in drilling, sawing, demolition and sealing. Our teams are experienced, qualified, knowledgeable and have the appropriate tools and equipment to carry out the work required on your construction site. In fact, National Drilling is well known throughout the UK construction industry with a reputation for providing skilled workers who consistently carry out work to a high level, taking into account safety standards at all times. To find out more about our business and why our clients rate us as number one read more here. We mentioned above some broad reasons for requesting expansion joint sealing, so let’s look at those in a bit more detail. Firstly, health and safety issues. One of the key reasons for providing expansion joint sealing to our clients is to reduce risks associated with health and safety. As the concrete slab or floor cures and contracts, the expansion joint may get wider and create a risk to those walking on the surface. This is particular risk where the area is used by the public and may mean that people are walking in the area wearing high heeled shoes or sandals which may get stuck in the gap or clip the edge causing people to trip or twist their ankle. Public safety is obviously a key factor so hazards such as these must be avoided. Secondly expansion joints may be sealed to reduce the damage that can occur to the edges of the joint with wear and tear and repeated pressure from vehicles or heavy traffic. If the edges of the joint starts to break down it can start to cause damage to wheels of cars or impact other users. It may also start to affect the integrity of the concrete slab. Thirdly in areas where chemicals are used there can be a risk that the chemicals may infiltrate the concrete and cause deterioration in the structure or contamination. How does expansion joint sealing work? Expansion joints are obviously used in construction all the time to allow space for the concrete to expand and contract according to the temperature and moisture levels, so what happens when you seal it? National Drilling Services has carried out research and tested various products to find the best sealants to avoid the risks highlighted above, but still enable the concrete to expand and contract. To understand more about the products we use see our page on Expansion joint sealing. If you would like to discuss your expansion joint sealing requirements then contact us on 0161 443 2822 or alternatively email us info@national-drilling.co.uk. The reason for cutting joints in freshly poured floors and surfaces is to allow for expansion as temperatures and moisture levels vary according to the ever changing atmospherics. Cutting an expansion joint allows for these changes to take place in the surface without resulting in any surface cracks or breaking. However, timing the expansion joint cutting is crucial to the success of this exercise. 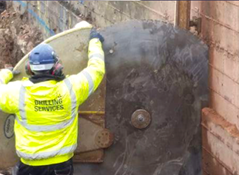 At National Drilling Services we have the specialist equipment, knowledge and experience to provide expansion joint cutting at the right time for your project. It is true that many companies may tell you they have the right tools for the job but the question is do they have the expertise? It is almost as important not to cut expansions joints too early as it is to leave it too late. Finding the appropriate window of time to cut expansion joints requires knowledge of the environment and project as well as expertise in expansion joint cutting. The last thing your project or site manager wants to see on a new floor or yard is a shrinkage crack caused by late sawing or for that matter joint raveling caused by early cutting. To avoid unwanted cracks or joint raveling, on your freshly laid floor, ensure that your expansion joint cutting is carried out by a reputable and experienced team. The operatives working for National Drilling Services are trained and experienced to the highest standards. Generally expansion joint cutting is completed within 24 hours of the slab being poured, subject to the environment and weather. A wide range of widths and depths can be specified to suit the requirements of the project. National Drilling Services work alongside many major floor laying companies, working with tight tolerances on super flat floors to external transport yards. In fact, some floor laying businesses request our services for many of their major projects including asking us to work for them in Guernsey and Jersey. So, if you are looking for a well established, reliable, UK based organisation to provide you or your client with expansion joint cutting then look no further than National Drilling Services. To contact us to discuss your expansion joint cutting requirements in more detail or to obtain an estimate for our services, you can contact us, or you can just give us a call on 0161 443 2822. Alternatively, you can also email us info@national-drilling.co.uk. Diamond core drilling is a specialist service, requiring specialist drilling equipment, expertise and knowledge. National Drilling Services is the UK’s number one go to provider of drilling services, with a reputation for reliability and high safety standards across the construction industry. 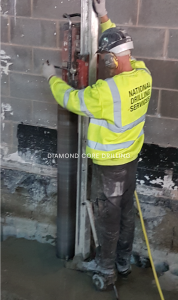 You can find out more about National Drilling Services on our website www.nationaldrilling.co.uk, where you will find a list of the services we offer including diamond core drilling, sawing, cutting and demolition. We have been involved in major high profile projects in the North West and across the UK but also work on small domestic jobs as required. Why use diamond core drilling from National Drilling Services? 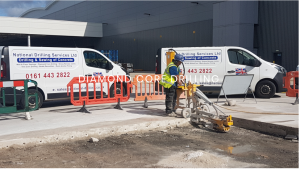 So, as you can see from all these advantages, diamond core drilling is a popular choice for drilling holes on construction projects and building sites, across the UK. The team at National Drilling Services works around the clock, all over the UK at the highest levels of health and safety. 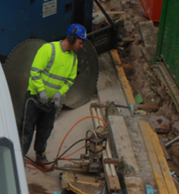 To find out more about how we can help provide you with diamond core drilling services, or other sawing, cutting or demolition services on your project, contact us on 0161 443 2822. Alternatively, you can email us info@national-drilling.co.uk. National Drilling Services is not just a well established drilling business, we also provide a range of demolition and sawing services to support the UK construction industry. Where demolition, sawing and indeed drilling is concerned you want to ensure that the supplier you use is established, reliable and experienced in these skills. It is also important to ensure that the correct equipment is available and suitable for the task in hand. National Drilling invests in appropriate equipment and resources to ensure we can provide wire sawing services as well as a range of construction site related services. When is wire sawing a good solution? To read more about wire sawing see our webpage. Why use National Drilling Services for your wire sawing requirements? National Drilling Services, as our name suggests, covers the whole of the UK. Our name is well known in the construction industry and is synonymous not only with drilling but sawing and demolition services as well. We are considered leaders in our industry with clients rating us as their number one choice in the UK. One of the reasons we rate highly in the market place is because of our very high health and safety standards, which is always a key factor on construction sites. We pride ourselves in providing a professional and reliable service and have been involved in high profile redevelopments including Manchester Airport, Liverpool One, work at the Etihad Stadium and Amazon’s Warehouse. Alternatively, you can email us info@national-drilling.co.uk. Concrete floor sawing is a reliable method of sawing used internally and externally but most commonly on major outdoor sites such as road carriageways and bridges. Who better to trust with such important precision cutting on a major scale than the industry experts? The team at National Drilling Services are well regarded in the UK construction industry. We have a range of diamond blades in different diameters to suit the requirements of all kinds of concrete floor sawing jobs. The strong and sharp diamond blades can cut through concrete slabs to a depth of 500mm. 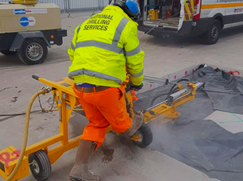 At National Drilling Services we only use the best equipment and the most reliable and robust blades, so ensuring we provide a consistently fast, accurate and efficient concrete floor sawing service. Using hard wearing blades made by top manufacturers means that … “saves our operators time and hassle, and it ensures we do a professional job every time”. For over thirty years National Drilling Services has provided important drilling, demolition and sawing services to the construction and building industry across sites all over the UK. Providing a reliable, professional and hassle free service over three decades has earned us the reputation for being the number one choice for our clients. 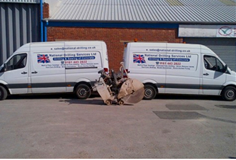 To find out more about us and the services we offer as well as concrete floor sawing see our website. Our team hold a range of accreditations and NVQ qualifications demonstrating our commitment to high levels of health and safety on every site and every project. Based in the North West we are well positioned for all the new developments and regeneration in the UK’s northern cities particularly Manchester and Liverpool. However, we also operate offices across the UK and provide our services around the clock. Although we have worked on high profile sites, we also serve smaller clients on less prominent projects. If you would like to talk to us about the services we could provide on your construction site, whether you require concrete floor sawing, demolition or drilling services or indeed the whole package, then do get in touch. You can contact us via the contact form on our website, or email your enquiry info@national-drilling.co.uk. Of course, you can also talk to us on 0161 443 2822. Do you have a project which requires a new lift shaft being added to a building? Or perhaps a design for an extra stairwell to lead to an extended mezzanine floor? There is often demand to increase space or office capacity in existing structures, which results in slotting in new access routes, an additional doorway or windows. If any of these feature on the drawing plans for your next construction project then you will probably be in need of some track wall sawing equipment. National Drilling Services are experts in all kinds of drilling and sawing. Our specialist equipment for sawing means we are well known in the construction industry across the UK. When creating new doorways, windows, lifts or stairwells track wall sawing provides vertical and horizontal cuts to enable the shaft or frame to fit into an existing wall. What is the cut depth of the track wall sawing equipment? National Drilling Services has the latest in high powered saws and hydraulic driven machines, providing vertical, horizontal or even inverted cuts in existing concrete and or brick structures. This equipment provides track wall sawing up to a maximum depth of 800mm. At National Drilling Services, we have a stock of diamond blades ranging from 450mm to 2m in diameter. This means we have the equipment and capacity to accommodate all wall sawing requirements. How does track wall sawing work? Track wall sawing, as its name suggests, involves a rotating diamond blade which cuts under control on a track mounted system. This enables precision cutting even on sloping surfaces. As this is remote controlled there is no need for the operator to be too close to the cutting. Remote control operation of the track wall sawing equipment also removes the risk of hand and arm vibration issues. In fact National Drilling Services are renowned for maintaining the highest levels of health and safety standards and are considered leaders in the construction industry. We have worked on all size of construction sites from multi-million pound projects, to supermarket chains to small domestic jobs. So, whatever your requirements for track wall sawing you can rely on the experts at National Drilling Services to meet your needs. Find out more about National Drilling Services and our track wall sawing equipment. To discuss how our track wall sawing equipment might assist on your construction site, contact us on 0161 443 2822. Alternatively you can email us on info@national-drilling.co.uk. Are you looking for an expert in concrete drilling? National Drilling Services is a well established business, well known across the UK construction industry as a leading provider in drilling and sawing services. Concrete drilling is one of those services. Our team of experts is experienced, reliable and professional and will work alongside your construction site managers, architects and project managers to ensure the drilling meets the criteria of the design plans and project specifications. As a regular provider of services to the construction industry, the team at National Drilling Services are only too well aware that health and safety on site is paramount. Whether we are providing services for concrete drilling, sawing or demolition, we pride ourselves in our ability to deliver a reliable and professional service whilst maintaining the highest health and safety standards. Although National Drilling Services has provided drilling and sawing services to very large projects in the past, we can also provide concrete drilling, sawing and demolition on a smaller scale or even to domestic projects. If you are looking to install dowel bars or other resin fixings, the rough edge created from concrete drilling provides the ideal surface for the resin to adhere to the fixings. What size of drill bit will National Drilling Services use for concrete drilling? As we have one of the best UK capabilities for drilling, as you would expect from experts, we have a range of drill bits. This means we can provide concrete drilling for small to large holes, with drill bit sizes ranging from 12mm to 50 mm in diameter. What’s more, in line with our high health and safety standards, we use Hilti anti vibration machines which reduces the risk of repetitive strain injury amongst our dedicated workforce. To find out more about National Drilling Services take a look at the relevant web pages. If you need other drilling or sawing services whilst we are on site we can also arrange that – just ensure you mention that when you contact us. To discuss your concrete drilling requirements or to make an appointment to meet up with us to talk about your construction plans, you can contact us either via the website contact form http://www.nationaldrilling.co.uk/contact-us/, or you call us on 0161 443 2822. Alternatively, you can email info@national-drilling.co.uk. how can we believe what they claim? will they meet our stringent on-site safety regulations? what is their approach to risk management? do they look after their staff? CHAS – CHAS accreditation means we have continuous access to the CHAS organisation who advise on health and safety compliance, setting industry benchmarks. So before you select a supplier to work with your employees on your construction site, first check if they are accredited to any of these bodies. National Drilling Services is well established in the construction and demolition industry, providing our clients with expert advice and excellent service across the UK. For more information do take a look at our website or contact us on 0161 443 2822. ‘Regeneration’ is a watchword often used in the construction industry in modern times. It usually relates to waterfronts and derelict industrial areas as well as city centres. When these sites are procured for construction, often they need to be cleared first and that is where our demolition experts at National Drilling Services recommend robotic demolition. 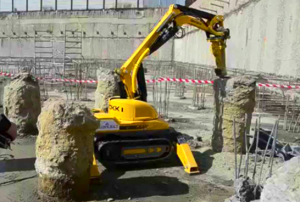 Robotic demolition uses a remotely controlled powerful robot to demolish old buildings, walls, chimneys and any other form of construction, which needs removing from your construction site. In former times this would have been carried out using a wrecking ball, which achieved the same result but with a greater amount of risk, time taken and less accuracy. So what is so special about robotic demolition? National Drilling Services is proud to be the owners of a Brokk demolition machine. The Brokk 100 is often described as a powerhouse in the demolition industry. It is 35% more powerful than its predecessor. You might be surprised just how compact it is considering its power capability. Most of our clients are impressed that such a powerful unit can be easily transported on a standard truck. Our investment in the Brokk 100 was not a decision we took lightly, but it indeed is not one we will regret. The benefits of having the capability to offer robotic demolition to the construction industry are multifold. Let’s look at the advantages of robotic demolition in clearing a construction site in preparation for a rebuild. With the Brokk demolition machine being relatively small it can access areas which historically would have caused challenges to demolition teams in the past, in fact it can even fit into lifts and climb stairs! 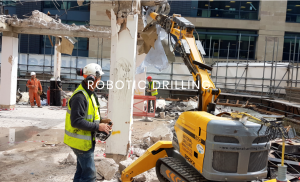 To find out more about how our robotic demolition can help with your construction project, give us a call on 0161 443 2822 or you can email info@national-drilling.co.uk or contact us through our enquiry form on our website.